Modern Masterpiece, Corinthian 7A Sells for $453,000! 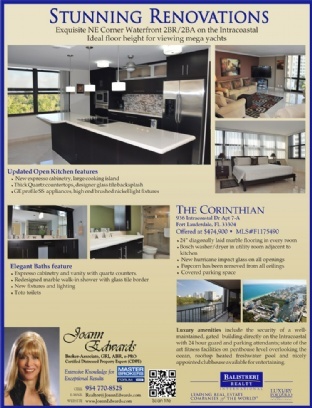 Yet another sale in The Corinthian Condominium Community! 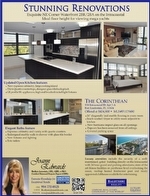 This remodeled masterpiece at The Corinthian, residence 7A, was just sold for $453,000. This 2 bedroom and 2 bathroom luxury residence was listed for $474,900 and has every possible advantage recommending it. What a lucky new owner! This large corner unit has new hurricane impact glass on all openings, smooth ceilings, 24 inch diagonally laid marble flooring, and a brand new Bosch washer/dryer in a conveniently located utility room adjacent to the kitchen. The great room features floor to ceiling high impact glass sliders with incredible views of the Intracoastal Waterway. In the kitchen, the updates include custom expresso cabinetry, a large cooking island, GE stainless steel “Profile” cooking appliances, quartz countertops, and beautiful designer glass tile backsplash. The bathroom updates include new expresso cabinetry and vanity with quartz counters, in the manner of the kitchen, and all new brushed nickel fixtures and lighting, with the energy efficient Toto Toilets. For those yachting enthusiasts, the residences on the 7th floor are the perfect location for viewing the Winterfest Boat Parade as well as viewing mega-yachts cruising up and down the Intracoastal Waterway day and night. It was really a pleasure seeing this transaction to completion. Residences such as 7A are moving quickly in the Corinthian. In 2012, new listings are going under contract in less than 30 days. This is no surprise to me with the uptick in both the Broward Marketplace and in The Corinthian, since I have been active in this building for years, representing both buyers and sellers. Features that buyers find attractive about this property are its incredible location close to gourmet restaurants, nightlife, and the premier shopping at the Galleria Mall, as well as its proximity to annual events such as the Winterfest Boat Parade, Air and Sea Show, and the 4th of July Fireworks. Another selling point is the financial security of this prestigious gated community. The Corinthian Condominium is immaculately run and considered one of the most financially sound buildings in the area, so investments are secure. Luxury amenities include a heated freshwater rooftop pool and Corinthian Club on the 24th floor, a 3 room fitness center on the 23rd floor, semi-private elevators, 24 hour security and parking attendants and covered parking under the building. Every residence offers wonderful waterfront views. The mid to high floors offer the most spectacular Ocean, park, Intracoastal waterway and city skyline views. For more information on this sale, other pending sales in The Corinthian, purchasing a property, or selling your own, contact me directly!